World Asthma Day looms – How Clued Up are you about the Potentially Deadly Condition? With World Asthma Day less than a week away, Medical Specialists® Pharmacy explain more about the common lung condition. Imagine the frightening prospect of being paralysed by fear as there is struggle to breathe, struggle to speak and difficulty even calling out for help. This is the very real prospect of an asthma attack. Every year on the first Tuesday of May sees World Asthma Day taking place, and this year the awareness day is falling on 3 May. The annual event has been organised by the Global Initiative for Asthma (GINA) since 1998 as a way to improve asthma awareness and care around the world. Therefore, as a provider of a wide variety asthma treatment to thousands of patients around the UK, Medical Specialists® Pharmacy feel obliged to discuss this serious health problem as a way to raise awareness about it. Asthma is a highly common chronic inflammatory disease of the airways typically characterised by varying and recurring symptoms, reversible airflow obstruction, and bronchospasm. Asthma sufferers can experience a multitude of highly uncomfortable symptoms. The most common signs are coughing (typically at night), shortness of breath, difficulty breathing, tightness in the chest and wheezing (a whistling sound in the chest when breathing). Let’s get one thing clear though: asthma isn’t just something used flippantly as an excuse to skip a P.E. lesson…it can kill. Imagine the frightening prospect of being paralysed by fear as there is struggle to breathe, struggle to speak and difficulty even calling out for help. This is the very real prospect of an asthma attack. Currently, there are around 5.4 million people living with asthma in the UK. Therefore, asthma is affecting an estimated 1 in every 11 people and 1 in 5 households. Those with the most severe cases of asthma can find simply climbing up the stairs a great challenge, let alone going outside and enjoying the sunshine as summertime approaches. Despite the fact asthma prevalence seems to have plateaued somewhat since the late 1990s, the fact remains that the UK still has some of the highest asthma rates across Europe and on average, 3 people are losing their life to asthma each day. In 2014 (the most recent data available) 1216 people died from asthma. Moreover, someone has a life-threatening asthma attack every 10 seconds in the UK and each day there will be 3 different families facing the heart-breaking loss of a loved one following an asthma attack – and two thirds of them could have been prevented. Health professionals don’t fully understand what actually causes someone to develop asthma, but it is often thought of as a combination of different factors. Although some factors could be genetic, many environmental factors are believed to be linked to the onset of asthma. These can include air pollution, chlorine in swimming pools and modern hygiene standards (also known as the ‘hygiene hypothesis’). There are no studies which can definitely say any of the previous issues cause asthma, but a number of environmental irritants could make it worse, such as dust, cold air and smoke. Anyone suffering with the typical asthma symptoms should book an appointment with their GP, who is able to make a diagnosis. The GP will ask how frequent the symptoms occur and at what times they appear; this may help to pinpoint factors that could trigger asthma symptoms. In addition, the GP could ask if the patient also has any allergic (atopic) conditions like eczema and hay fever, as these two are often prominent alongside asthma. If the doctor feels that the patient has asthma, they will be able to prescribe suitable medication to treat the condition, which usually comes in the form of an asthma inhaler. These types of asthma medicines are devices that will deliver the medication straight to the lungs as the patient breathe in. This method is effective of getting the treatment to where it is needed with very little ending up elsewhere within the body. Different inhalers can alternate in their method of function, therefore patients should receive training from their GP or nurse on the correct way how to use the device, and advice for how their child should use theirs (usually a spacer, sometimes with a spacer mask). This needs to be checked at least once every year. For asthma patients that have already been prescribed an inhaler or may have lost their inhaler, or run out and cannot get a prescription immediately, Medical Specialists® are able to supply an inhaler to help relieve the asthma symptoms, offering a wide range of different asthma treatments. 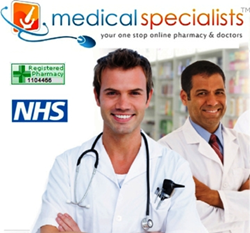 These can be obtained after patients have completed an online consultation with one of the GMC-registered doctors at Medical Specialists®, or sent in a private prescription by post, acquired from the patient’s own doctor.